This is where we left the coop at the end of the day. The remaining work is the door to the run (to the left), the door to the front of the coop (center) and the wall with the nesting box. Seven hours of work in freezing temperatures got us ahead of the curve. Matt and I bundled up in ski pants, winter boots, hats and gloves … and worked until the sun set in the sky. Two cups of hot cocoa and sheer hustle kept us from freezing solid. But the payoff was big. We finally installed the back wall of the chicken coop, along with the remaining mesh and lower framing. We also got a start on the side wall that houses the nesting box. The good news is that I have a sassy answer for each one of these snotty revelations: Trim board. I’m certain trim will save the day and cover all my blemishes. I hate to guess how close we are to finishing the coop, but it feels like we’re in the final stretch. My goal is to have the coop finished by the end of the year, so I can get it inspected and ready by the time we get chicks in February. We also had a breakthrough. We finally learned how to use the SketchUp 3-D design software, which is used for the Wichita Cabin Coop design. I had figured out how to move the model around, but now we can deconstruct walls to see how they are put together. This came in extraordinarily helpful for figuring out how to build the coop door. For weeks we were mystified. We Googled images of similar doors, and just couldn’t figure it out. Now with the help of this software, we now unlocked the secret. And of course, it wasn’t that difficult after all. I’m hoping the rest of the project falls in line just the same. This is looking pretty good! Way to go – it does, indeed, look like you are almost there! Thanks so much! It’s hard to believe we’ve come this far. 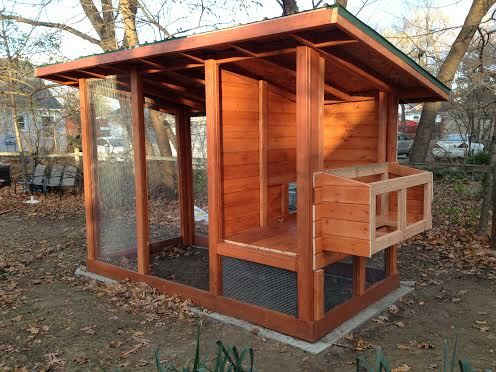 I’m very excited to get the coop finished, and to start thinking about the chicks! !